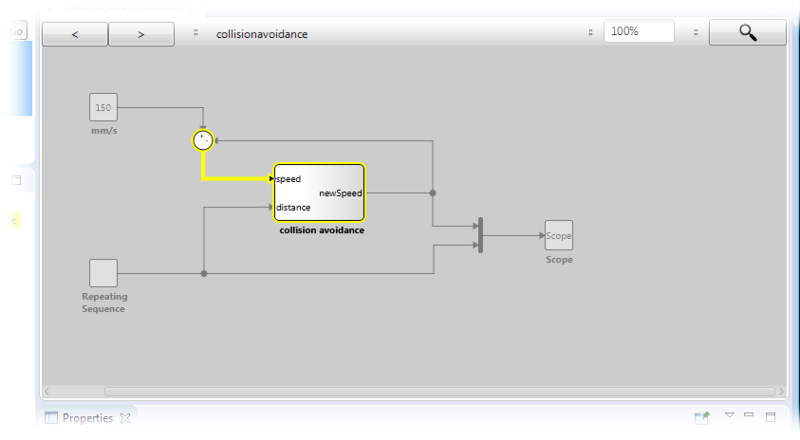 YAKINDU Model Viewer provides functionality to trace and highlight signals. 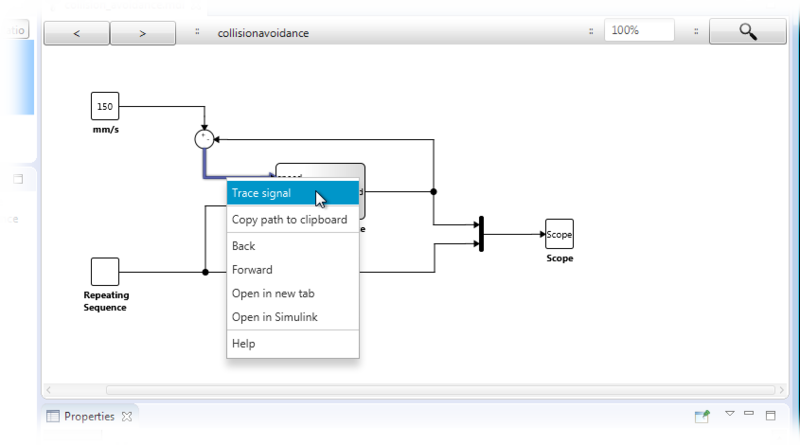 To activate the signal tracing feature, right-click on a signal, and select the Trace signal context menu entry, as shown in figure "Starting a signal trace". The signal trace is highlighted in the currently visible system, see figure "Highlighted signal trace". All elements that are not part of the current signal trace are grayed out. When navigating into subsystems, the signal trace remains being highlighted, see figure "Highlighted signal trace in subsystem". Additionally, the active signal trace will be highlighted in each open tab showing any elements that are included in the signal trace. 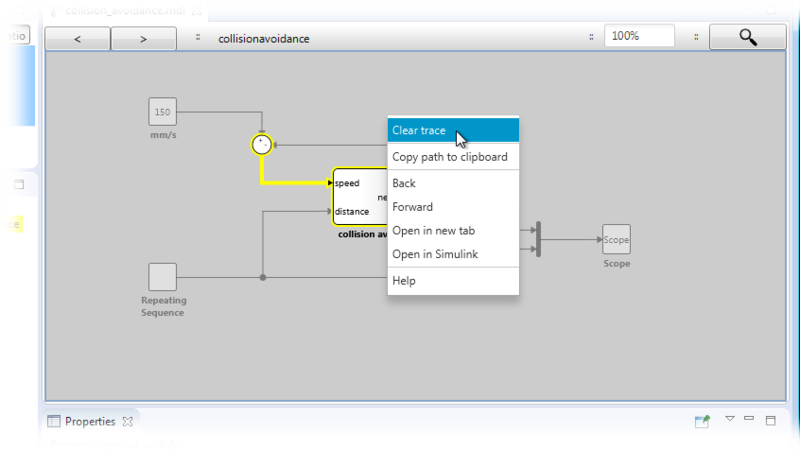 You can quit highlighting the signal trace by selecting the Clear trace entry in the context menu. This entry is available in the menu whenever a signal trace is active. With YAKINDU Model Viewer, you can continue an existing signal trace. To do so, hover the mouse cursor over a signal („hovered signal”). An animated dotted line appears and indicates that the current signal trace is continuable to the hovered signal. To actually continue the signal trace to the hovered signal, double-click on the dotted line. As a result, the existing signal trace is extended by the hovered signal. The continued signal trace is also maintained in subsystems. Clicking through subsystems to follow a signal trace is cumbersome. The Signal trace view offers a different approach: It shows the complete active signal trace in a flattened-out way; see figure "The Signal trace view" . Activate the view via Window → Show View → Other… → YAKINDU Model Viewer → Signal trace. 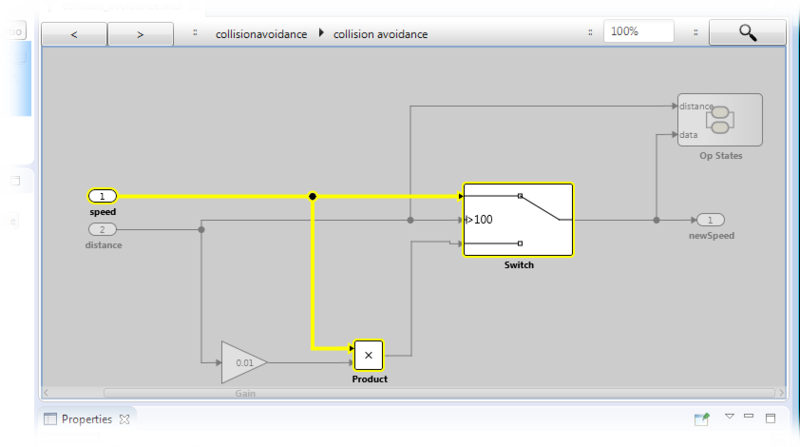 The Signal trace view shows the whole signal trace as a single graph, including the parts extending into subsystems, here: collision avoidance. Double-click on an element in the Signal trace view to navigate to the corresponding element in the main view.